The Station is in the church of St. Mark, which was built in the fourth century in honor of the evangelist, by the holy Pope Mark, whose relics are kept there. Collecta at St. Adrian. 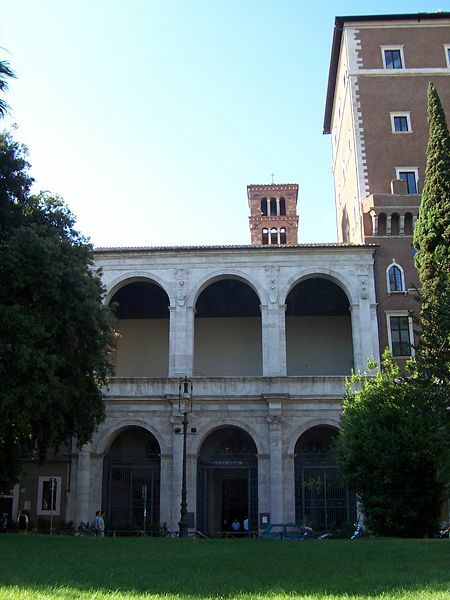 Station at St. Mark The church of St. Adrian was dedicated by Pope Honorius I (625-38) to the memory of this famous martyr of Nicomedia, who, during the Byzantine era, was the object of much devotion in Rome. The stational Basilica de Pallacine, dedicated later on to St. Mark the Evangelist, was erected by the Pope of that name (337-40), and is the only church in Rome sacred to the memory of this devoted disciple of St. Paul, and faithful Interpreter of St. Peter, who wrote his Gospel after St. Peter’s death, at the request of the faithful in Rome. The scriptural passages read to-day have in mind the Eastern origin of the titular patrons of the Basilica, and tell us, therefore, of the Syrian Naaman, who, rejecting the grander rivers of Damascus, was cleansed from his leprosy in the lesser waters of the Jordan. Catechumens desiring to be healed from the leprosy of infidelity and original sin, must humble themselves, and, abandoning the rivers of Damascus- that is, the attractions if their former worldly life- must wash themselves clean in she pure waters of holy baptism. This basilica was originally dedicated to St. Mark the Evangelist. According to tradition, the author of the second Gospel, the man named Mark who is mentioned in the New Testament with Peter and Paul, is the same John Mark mentioned in the Acts of the Apostles and, it is sometimes said, the young man who ran away when Christ was arrested in Gethsemene. If these identifications are correct, then we learn that St. Mark was the son of a woman householder in Jerusalem named Mary, that St. Barnabas was his cousin, that he helped to evangelize Cyprus, and that he rejoined Paul in Rome where he probably wrote his Gospel. Papias, writing around 140, said that St. Mark was the interpreter of St. Peter. Later, Mark is said to have evangelized Alexandria, to have become bishop there, and to have been martyred under Trajan (98-117). In 829 the Venetians appropriated his relics and the “winged lion” has been their symbol, and patron saint, ever since. This church was later also dedicated to Pope Saint Mark (336). Built by Pope St. Mark over an older oratory, the basilica became known as the titulus Marci, one of the original twenty-five parishes of Rome. The structure has been rebuilt several times, and the current rich and elegant interior is of the late-eighteenth century. The massive travertine portico and loggia, which precede the church, were constructed in 1465 by Pope Paul II (1464-1471) with stone quarried from the Colosseum to integrate San Marco into his new Palazzo Venezia. The upper story served as his loggia of benediction. In the portico note, on the right wall, the funerary inscription of Vanozza Cattanei, mistress of Pope Alexander VI (1492-1503) and mother of Cesare and Lucrezia Borgia. Inside, note especially the columns veneered in Sicilian jasper and the coffered fifteenth-century ceiling by dei Dolci, architect of the Sistine Chapel. It may be the oldest such ceiling in Rome, rivaled only by that of St. Mary Major. The rough apse mosaic from the ninth century depicts, from left to right, St. Agnese, St. Agapitus, Pope Saint Mark, Christ giving a Greek blessing, St. Felicissimus, St. Mark the Evangelist, and Pope Gregory IV (827-844) offering the church, which he restored following a severe flood. It was the last major mosaic in Rome for three hundred years. Visit the ninth-century crypt of Gregory IV, and try to see some of the church’s vast relic collection, including Sts. Abdon and Sennen, two Persians martyred in the Colosseum. The church also contains the body of Pope St. Mark and relics from the Holy Innocents murdered in Bethlehem by Herod. The station was formally erected by Gregory the Great and is the national church of Venetians. One former Patriarch of Venice to have become titular of this church was Albino Luciani, later Pope John Paul I.